Julie! that's such an exciting news!! 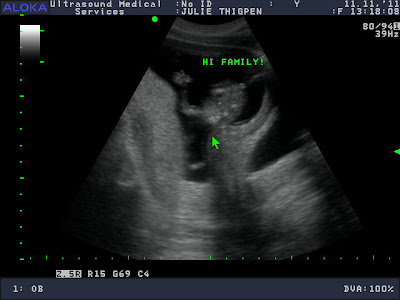 I promised my self not to blog around today but I couldn't help to click by watching the ultrasound on my dashboard! such a miracle! now after 3 months we can say everything's safer! with my now 1 year old baby I registered to babycenter.com and week over week they send you information on the status of your baby.. what is normal and what's not! Good luck!! and Congratulations!!!! Congrats Julie! Such an exciting news! My best advice... do what feels right not what other people tell you that you should or shouldn't do. Mostly enjoy yourself! Things really change once a baby comes along. Congrats!!! Congrats!!! I just had a baby boy 3 months ago and it has been the best gift life has given me it changes you completely and the love ohhh the love you will feel. Go to babycenter now and sign up, as a previous poster just said, it was the best guide for my pregnancy and I also signed up for the birth club of my month and was able to make new friends that were going through the same thing I was great help! Congratulations Julie! I began following your blog recently. Your posts are so generous. I wish you all the happiness in the world! julie!!! yeah for you guys!! right when i saw this i was smiling the biggest smile, you should have seen it! so, super happy for you both. cannot wait to hear updates! again, thinking of you and so wishing you an easy and memorable pregnancy! Huge congratulations to you and your husband. My advice is to take everything one day at a time now, and when your son is born. You'll instinctively know what to do. Congrats!!! You're due on my Husband's b-day- and he is sweet and perfect (and a bit stubborn sometimes). We're expecting a little girl in a month and we're also doing the one bedroom apt thing. While I wish I could design a nursery, I have still done some good baby decorating in our bedroom. I've also tried to purge all the stuff we don't actually need! Congratulations !!! That is the best news :) I can only imagine how gorgeous you will make his little area ! How exciting!!!! One big, huge congratulations to you and your husband, Julie!! Best news ever! Congrats, what an amazing time of your life this will be. Congratulation! What a very exciting news. CONGRATULATIONS!!! That is super duper exciting!! Our little boy was born in May this year. It is such a fabulous journey, enjoy it all! Congratulations!!! Enjoy the experience, it's a wonderful one. Oh my gosh! So exciting!! Congrats!! oh, my! oh, my! i am sooooo happy for you! i relate to so much of what you wrote here. we, too, experienced a loss before we experienced a pregnancy that took. i'm so happy to hear that you have been blessed with a healthy baby... what a sweet little sonogram shot. 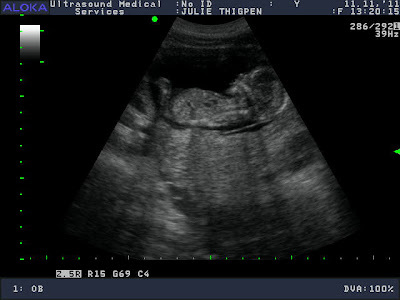 after trying for years, we finally had a boy... very unexpectedly. we had him last june. it has been the best five months of my life! and like you, i was so amazed at the miracle of God's design of life growing inside my womb. it was truly indescribably awesome! i'm so excited for you. pregnancy is so much fun, and i actually miss it quite a bit... even with the nausea and aches that come with it. seeing others get pregnant and have babies makes me want to do it all over again! it was the best experience of my life... even labor and delivery. you will be an amazing mom, as you are a beautiful and amazing person and designer. and i am sure you will be the cutest pregnant person out there. i think the baby's nursery will be the most stylish when you get the chance to have one for him or her. oh, gosh... i'm just gushing. i don't always get a chance to read your posts, and even when i do, it's through my e-mail, as i subscribed to your blog. but when i read this post, i just had to pop over and relay my biggest CONGRATS to you! what wonderful news! i'm thrilled. blessings to you and your growing family! please keep us posted with your growing belly and ideas for the eventual nursery! Congratulations! This is such an exciting news! Wishing you a happy and healthy pregnancy. By the way, I am hosting a darling giveaway. Come by and enter for a chance to win a set of charming Vintage Alphabet Cards from Children Inspire Design! i am so happy for you Julie...may God bless and protect you both. This is amazing news! Congratulations. Your family deserves this =). Enjoy every minute. One word...Mocktails! Best wishes for a healthy pregnancy. Many congratulations to you and your hubby! Its really exciting! Best wishes for a healthy pregnancy! Congrats! You will be a wonderful Mommy! Just continue to follow your instincts and heart and everything will be fine! Continued blessings! Awhhh congrats!!!! Can't wait to see your nursery plans. I have two boys and they're just amazing. Congratulations! I hope that you continue to be blessed! So exciting - congrats to you! Many blessings! Congratulations Julie! That is so exciting! I'll be looking forward to more baby-related updates! Congratulations! What a wonderful blessing. I can't wait to see your nursery plans!! YAY!! I too have suffered a miscarriage and am trying to get pregnant with our first child. Your news make me so happy and full of hope! All the best. JULIE! That is amazing news! Congratulations! Wishing you nothing but the best with this whole experience! YAY!! Congratulations!!!!!!! I know he will be a well-loved baby! I can't wait to see the nursery you'll design for him! Flipping around your blog and saw this....so happy for you. Also so glad to be a new follower...will be stalking you more soon! Congrats! And all the best with baby's soon arrival. God bless.